To determine if you are a good candidate for LASIK surgery in Toronto, you will need to arrange for a complimentary assessment at the Skouras Eye & Cosmetic Centre. If you are not a good candidate for LASIK, you may be eligible for another laser vision correction procedure such as PRK. LASIK surgery has undergone several changes and improvements over the years. One of the latest and most advanced forms of LASIK is iLASIK, which uses IntraLase® and CustomVue™ technologies to provide stellar visual outcomes. Dr. Skouras uses state-of-the-art technologies such as VISX S4 Excimer Laser and the new Alcon WaveLight® EX500 Excimer Laser combined with iDesign suite from VISX. Alcon Wavelight is the fastest refractive surgery platform available on the market, with a treatment time of only 1.4 seconds per diopter. The new iDesign suite diagnostics for the VisX S4 gives even more precise corneal mapping information, thus providing even better laser vision correction results. Having the option of utilizing both VISX S4 laser and Alcon Wavelight laser gives Dr. Skouras the ability to provide custom results based on your individual refractive requirements. IntraLase, also known as bladeless LASIK, is a revolutionary technology that has changed the face of refractive surgery. This all-laser procedure uses a sophisticated laser in lieu of the metal blade used in conventional LASIK. Prior to the advent of IntraLase technology, the corneal flap made during LASIK and other vision correction procedures was made with a blade called a microkeratome. In contrast, IntraLase uses laser energy to create the incision, in turn producing a thinner flap, providing superior safety and preserving most of the natural cornea. IntraLase has vastly reduced the risk of complications associated with creating the corneal flap. Before creating the corneal flap, Dr. Skouras uses VISX’s CustomVue or iDesign platforms to create a unique map, or “fingerprint,” of your eye. With CustomVue or iDesign, Dr. Skouras is able to use detailed information from your eyes to calibrate the laser so that your procedure is fully customized. The CustomVue and iDesign platforms allow Dr. Skouras to correct your unique refractive errors so that you end up with optimal post-operative vision, regardless of which type of refractive error you have. If you are concerned about the cost of LASIK surgery, we can work with you to come up with a plan that fits your budget. If necessary, we will discuss financing options with you, such as patient financing available through Medicard. The staff at Skouras Eye & Cosmetic Centre looks forward to speaking with you about your options. For more information on pricing and financing options, please call Skouras Eye & Cosmetic Centre at (416) 590-0445. Before beginning the LASIK procedure, Dr. Skouras administers numbing eye drops. Next, he uses the IntraLase femtosecond laser to create a precise flap in the epithelium, or outer surface, of the cornea. The laser’s computer-guided pulses move across the cornea, creating tiny bubbles at a pre-specified depth at the perimeter of the area designated for the flap. These bubbles cause the tissue to perforate. After gently peeling back the corneal flap to access the underlying corneal tissue, Dr. Skouras uses the excimer laser to alter the shape of the underlying tissue, correcting the patient’s refractive error. The thickness of the tissue removed by the laser’s cool beam is less than that of a hair. LASIK takes just a few minutes, and most patients do not experience discomfort. Many patients enjoy immediate results, with vision continuing to improve over the next several days. Following the procedure you will need to rest briefly. You will need to arrange for someone to drive you home. When you get home, it is important that you rest for a few hours, with your eyes closed, and avoid computer use and reading for prolonged periods of time for a couple of days following surgery. Recovery from LASIK surgery varies slightly by patient. Some people are able to return to work the next day. However, if possible we recommend that you rest for a couple days before returning to work and your everyday activities. Do not rub your eyes during this time, and avoid participating in vigorous exercise for a few days. The team at Skouras Eye & Cosmetic Centre will provide you with comprehensive postoperative instructions. It is crucial that you follow these instructions closely and take the medications we give you as needed. Contact our office immediately if you have any concerns. What is custom LASIK with CustomVue/IntraLase? Also known as iLASIK, custom LASIK with CustomVue and IntraLase is a form of LASIK in which advanced technology is employed to enhance the results. Specifically, special diagnostic equipment is used to map your eye’s refractive error, and two different lasers will be used: one to create a flap in your cornea and another to remove tiny amounts of tissue to reshape the cornea, which is what gives you clear vision. The technology used in custom LASIK is what distinguishes it from traditional LASIK. What is the difference between traditional and custom LASIK? 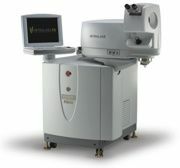 The difference between traditional LASIK and custom LASIK lies in the sophistication of the equipment used. Both involve the creation of a corneal flap, but custom LASIK uses a more precise technology called VISX iDesign Suite to map the cornea prior to the creation of the flap. This technology is able to identify even the minutest refractive errors, called higher order aberrations. As a result, the map it produces is highly individualized and precise. Every surgery has some risk of complications, and LASIK is no exception. The good news is, very few people experience any serious complications. Potential complications include halos around lights, glare, flap complications, under-correction or over-correction and dry eyes. You will undergo screening to determine if you are predisposed to any complications or healing problems. By having LASIK with an experienced refractive surgeon like Dr. Skouras, you minimize your risk of experiencing complications. Recovery from LASIK is fairly straightforward. Following your procedure, you will need to arrange for someone to drive you home. Once home, you will need to keep your eyes shut (as much as possible) for a few hours. Some people wake up the next day with clear vision and are able to go to work or resume their everyday activities, while others take a couple of days to achieve clear vision. We recommend that you take a couple of days off after your LASIK procedure. Avoid rubbing your eyes for a couple of weeks, and avoid swimming for one month following surgery. There should not be any pain, but you will be given anesthetic drops to minimize any discomfort during your LASIK procedure. Following the procedure, we may prescribe pain medications. Overall, LASIK is not considered a painful procedure. Laser vision correction is a procedure that improves vision by using a laser to permanently change the shape of the cornea. Often referred to as LASIK, it is the most commonly performed laser vision correction procedure and is an effective treatment for a wide range of vision problems. During the LASIK procedure, patients might experience a sensation of pressure during certain steps, but patients rarely describe it as painful. Typically, there is little or no discomfort following LASIK. PRK is usually painless. Following PRK, patients can have mild to moderate eye pain for a day or two. The 3D ActiveTrak™ system of Advanced CustomVue LASIK tracks eye movement in all three dimensions during your procedure. The 3D ActiveTrak™ feature automatically tracks the tiny motions of your eye in all three directions during the laser procedure, so that you don’t have to worry about moving your eyes. Will laser vision correction eliminate my need for reading glasses? No. The need for reading glasses is caused by the natural aging of the eye, a condition known as presbyopia. The muscles of the eye that allow us to accommodate for near and far vision weaken over time causing us to need reading glasses. This is a separate condition from nearsightedness or farsightedness. How do the visual outcomes of the IntraLase Method compare to the microkeratome method of creating the corneal flap? Clinical studies confirm that patients achieve better vision with IntraLase. More patients achieve 20/20 or better vision with IntraLase-initiated LASIK. IntraLase creates fewer high- and low-order aberrations, conditions associated with night glare and halos. IntraLase patients have a reduced incidence of post-operative dry eye symptoms. IntraLase patients required fewer enhancement procedures following LASIK. The precision of the IntraLase flap significantly reduces the incidence of post-operative induced astigmatism as compared to a microkeratome-created flap. Does the Advanced CustomVue system really produce better results than traditional LASIK? Yes. Using Wavefront technology, the Advanced CustomVue system creates more accurate measurements and treatments from start to finish with every patient. Until this system was developed, LASIK was a “one size fits all” procedure, so to speak. Advanced CustomVue allows each patient to have a truly customized LASIK procedure. What is Iris Registration Technology? It’s normal for patients’ pupils to shift positions from the time their eye is measured to the time of the treatment. Iris registration technology centers the treatment correctly, independent of the changes in the pupil center. What make Advanced CustomVue LASIK different than other procedures? The combination of WaveScan WaveFront System measurement technology and the sophisticated capabilities of the VISX STAR S4 IR Laser System enable doctors to calculate a more precise and individualized treatment. Who is a candidate for Advanced CustomVue LASIK? If you are 18 years of age or older and wear glasses or contacts to correct nearsightedness, farsightedness, astigmatism or mixed astigmatism, you may benefit from Advanced CustomVue. Schedule a free LASIK consultation with Dr. Skouras to determine your candidacy. Will I need glasses or contact lenses after my Advanced CustomVue procedure? Individual results may vary, but one year after the clinical study for treatment of myopia, all participants saw well enough to drive a car without glasses or contacts. Most participants achieved 20/20 vision or better. If you are interested in booking your complimentary assessment for LASIK, call (416) 590-0445 or email our office today to speak with a member of our team.